In keeping with Blount’s wishes, his collection was displayed to the public in its entirety from 1988 until Blount’s death in 2002. Most of the watercolors were then moved for safekeeping to the vault. They were only removed for special shows or teaching purposes. Nevertheless, significant fading of the watercolors had already occurred by that stage. Margaret Ausfeld put together a show of Hopper’s watercolors in 1999 with Smithsonian American Art Museum Curator Virginia Mecklenburg. The two took a ‘Thelma and Louise’ type road trip to view Hopper’s watercolors in person. They knew that the only way to judge these works is by putting them in front of you. 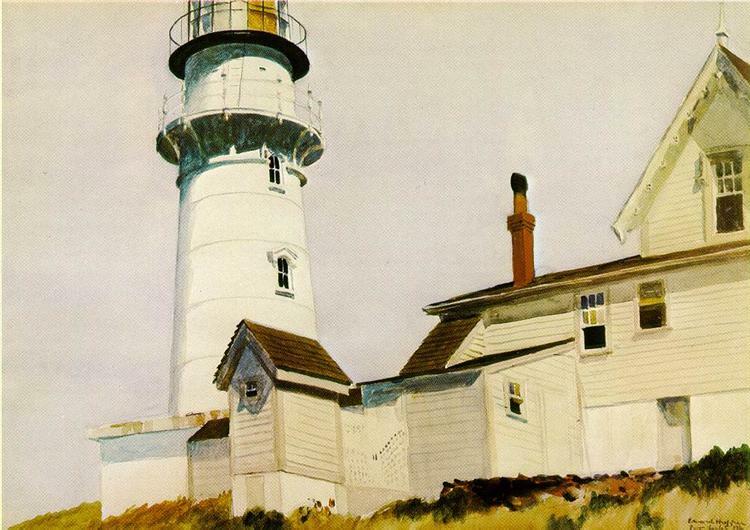 Ausfeld realised how difficult it was to accurately reproduce the colors in Hopper’s watercolors when it came time to put together a catalogue to accompany her exhibition. Back in her office, she shows me examples of tonal variation and washout that photography adds to the original picture. She also shares stories about seedy truck stops and motels along her own road trip. During the period in which Hopper painted the Montgomery watercolors, Ausfeld says watercolor still ‘intrigued and entranced him.’ Compared to the deliberate nature of his oils, the watercolors were, she believes, a ‘more loose manifestation of what he was thinking and feeling at the time’ and thus more revealing of his personality. Hopper’s watercolors also differ markedly from the oils in their subject matter. He painted the majority of his watercolors en plein air in New England in summer. Boats, lighthouses and local architecture feature prominently. The oils, for the most part painted in his studio in New York, portray the urban scenes for which Hopper became most famous. The divide between urban and nature, oil and watercolors, is a source of tension within Hopper’s work. This tension was mirrored in his life. From the 1920’s onwards, Edward and Jo Hopper split their time between New England in the summer and Greenwich Village in the winter. They eventually built their own home in Cape Cod in the 1930’s. Sanborn was the First Baptist Church minister in Hopper’s hometown of Nyack for nearly twenty years. The church itself was founded by Hopper’s great grandfather. Sanborn cared for Hopper’s sister, Marion, as she was dying. He later helped care for Jo and Edward Hopper during their final days. Sanborn was nominated as one of the six legatees of the Hopper estate and came into possession of many of Hopper’s notebooks and personal effects. He retired to Melbourne, Florida. Melbourne is one of our next stops as we leave the Mississippi behind for the sun-kissed Caribbean coast of Florida.